Want to beat the summer heat? Tired of relying on the AC for relief? Head for New Hampshire: home to New England's only commercial caves and one of New England's largest water parks. No matter how high summer temperatures soar, New Hampshire offers fun ways to chill out. Watching the mercury climb and climb? There's one place where it's always cool: a cave! Not only are caves fun to explore, they have the natural advantage of always being cooler and less humid than the steamy world above. There are two neat cave attractions to explore in New Hampshire's White Mountains region. They're located about a 40-minute drive apart, so you can see them both in a single day if you're a fan of caves. 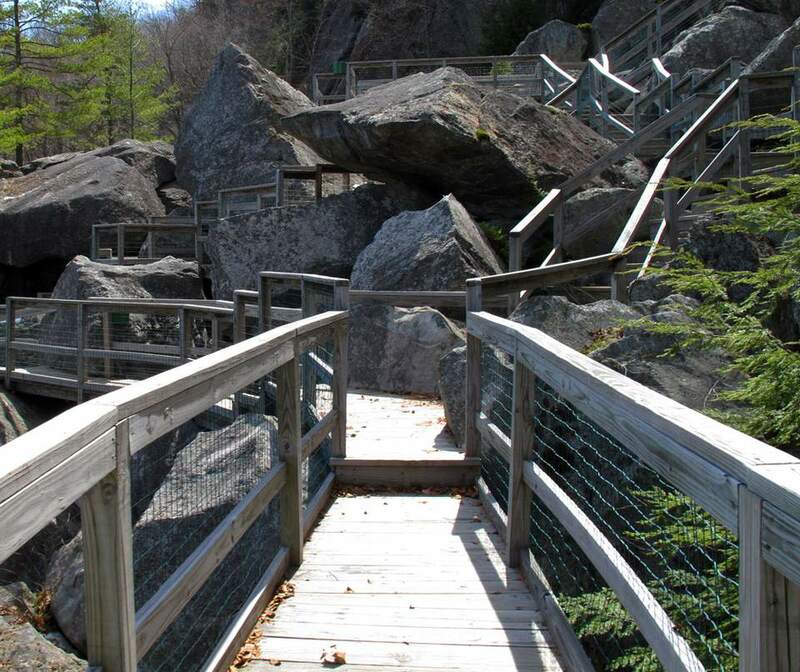 Lost River Gorge & Boulder Caves in North Woodstock, New Hampshire, is sure to provide cooling relief on a hot summer day. The granite here has been chiseled and shaped by the hand of Mother Nature for 300 million years. Your hour-long, self-guided tour through glacier-carved caverns, steep-walled gorges and plunging waterfalls will leave you in awe of nature's great forces. Wouldn't you choose the cooling mist of a waterfall over central air conditioning any day? For an extra cool adventure, book your spot on a nighttime Guided Lantern Tour. Lost River Gorge is open mid-May through October (weather conditions permitting). Polar Caves Park in Rumney, New Hampshire, is another cool spot that's open daily from spring through late October (weather conditions permitting). The Polar Caves were created some fifty thousand years ago as the third continental glacier blanketed the White Mountains in northern New Hampshire. As the ice receded, it carved out an impressive series of nine granite caves and passageways that are fascinating and fun to explore. Self-guided tours lead to a rock garden, along nature trails lined with pines and through the caves. To get to Polar Caves Park, take exit 26 from I-93 at Plymouth, then go five miles west on State Route 25. Admission prices are a bit more affordable than you'll find at Lost River Gorge, so this is a budget-friendly choice for families. Caught the cave bug? Plan a visit to Howe Caverns in New York State, next. One of New England's largest water amusement parks, Water Country, is located in Portsmouth, New Hampshire, near the state's compact seacoast. With more than a dozen different water rides and attractions including giant slides and Dr. Von Dark's Tunnel of Terror, plus many more activities on 47 acres, you're sure to spend a refreshing day at the park. Water Country boasts New England's largest wave pool: It's 700,000 gallons of water! Rides range from those appropriate for the tiniest of tots to big thrillers including Racing Rapids and the utterly dark, roller coaster-like thrill of Black Hole. Information to help you plan your day at the park is available at the Water Country website. You'll save time at the gate by purchasing your all-day tickets online in advance. Visit the Lakes Region Tourism Association website for all of the information you need to enjoy swimming, fishing and boating on Lake Winnipesaukee's cool waters. Located in central New Hampshire, the state's largest lake covers 72 square miles and offers a host of summertime fun activities. Take a tour of 12 New Hampshire waterfalls with this guide to the scenic falls of the Mt. Washington Valley. SwimmingHoles.org leads you to more than 50 old-fashioned New Hampshire swimming holes, including Crystal Cascade in North Woodstock, with its natural water slide. Neat! If you want to weather-proof your family's summer getaway, book a stay at one of North Conway, New Hampshire's indoor waterpark resorts: the Red Jacket Mountain View, home to the Kahuna Laguna 40,000-square-foot indoor waterpark, or the Hampton Inn & Suites with its more modest 5,000-square-foot waterpark. There's one place in New Hampshire where, no matter how hot it gets, it's always December. The 25th of December to be precise! Santa's Village in Jefferson is a great place for a day of shows, rides and even a chance to meet Santa himself in his relaxed "off-season" mode. For more information, call 603-586-4445. The Oldest Store in the USA... Perhaps!